The Pneumatic Walker Diabetic System provides pneumatic support with Aircast full-shell protection and is available in 3 sizes (medium, large and X-large). Foam filled aircells cushion the ankle for customized comfort and support while reducing pressure points. This support is effective in managing edema and fracture healing. Special Promotion: Includes Hygiene Cover. Lightweight design: rigid foot, flexible around calf for strength, fit and comfort. Low profile for natural gait. I did Achilles tendon repair surgery on left ankle. The doctor asked me to buy aircast shoe, with the angle of elevation of 20%. Do you have shoes that you can change the angle? Please Please Keep me it's really urgent. Thank you for your question. The Aircast Heel Wedge will fit in an Aircast Walking Boot. This brace is for Diabetic patients who have Ulcers. I have been wearing my Aircast XP for walking boot for 2 weeks since receiving it from my surgeon. I do wear it to bed. It has begun to stink. Can I wash it by hand? if so, should I remove the soft cloth liner from the hard plastic outer part or leave it attached? Yes, you can remove the Foam liner at the top of the boot and hand wash with mild detergent. You can also wipe down the AirCell Liner. Thank you for contacting Product Support. The Brace-Lok function works for both the XP and XP Diabetic walkers. It is used to insure compliance with the patient. It is placed around the boot and locked so that the boot can not come off, unless it is cut off. If you have any other questions please do not hesitate to contact us. I recommend getting the top of the line Ankle Walker, it's the lightest we have, with a heel strike technology and rocker bottom. How many individual aircell compartments are there? Where are they located? Do they each have their own air injection nozzle. The XP Diabetic has 4 aircells, one on each side of the ankle and one on the back at the achilles, it also has one in the rigid front panel. Each cell has their own air injection site. What is the difference between the Aircast XP Diabetic Walker System and the standard Aircast XP walker? 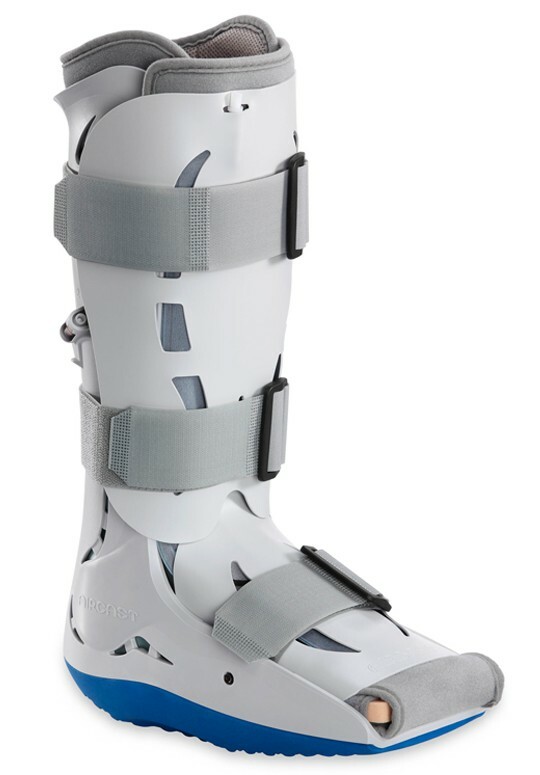 What are the special features in the diabetic version of this walking cast boot? With the XP Diabetic Walker you are going to get our dual-laminate insole and the Impax Grid technology, these help to eliminate pressure points and off-load the diabetic foot. The Impax Grid allows you to remove areas of the insole to take the pressure off of any sores or "hot spots". You will also get extra insoles, 3 stockings and the pressure gauge hand bulb to help pump the aircells to a desired amount of pressure. The idea behind the diabetic style is to help those patients with diabetes that need to be immobilized but that may have current sores or that are more prone to get sore. I have one of these walkers and need to replace one of the velcro straps / what do I do??????? Thank you for contacting us regarding your desired replacement part. Unfortunately, we do not carry this item at this time. You may contact the manufacturer directly at the number listed below.